The conclusion that grid parity for solar power is imminent in several countries has been reached by the PV Parity project, PV Magazine has reported. The conclusion is based on various factors such as retail electricity prices, solar system prices, the cost of financing, and the rate of consumption of electricity per user. PV Parity looked at grid parity in residential, commercial, and utility-scale solar PV (solar panel) projects. They developed roadmaps for each sector in the countries surveyed. The conclusion was that this year grid parity is already “starting to be achieved” in Germany, southern Italy, Netherlands, and Spain. Over the coming two years, northern Italy, Portugal, and Austria are expected to follow; other countries in Europe should not be far behind. It was found that for the residential sector, the dates for reaching grid parity may vary widely between the various countries surveyed, due to solar irradiation variations, the maturity of each market, and of course differences in local retail electricity prices. This is really great news for the future of renewable energy around the world, and I’m sure it’s starting to happen a lot faster than many people expected. Not a week goes by without someone (usually a very pro-fossil fuels person) arguing with me that renewable energy is too expensive to ramp up significantly, and that it always will be – or at least for a very long time. That argument may not hold water for very much longer. The PV Parity project involves a partnershop between the following entities: WIP – Renewable Energies, Germany; European Photovoltaic Industry Association (EPIA), Vienna; University of Technology (TUW), Austria; Imperial College of London, United Kingdom; Technical University of Crete, Greec; ECN, Netherlands; IDAE, Spain; Gestore dei Servizi Energetici (GSE), Italy; Stiftung Umweltenergierecht, Germany; ENEL Green Power, Italy; EDF Energies Nouvelles, France. 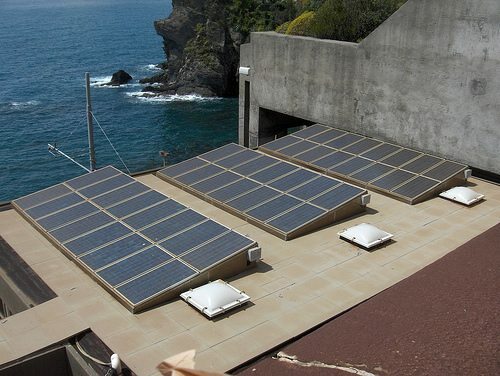 Image CC licensed by Chris Muenzer: Solar panels in Italy.